So who controls the other 20% of LightSquared? Intriguingly, yesterday’s Reuters article about Harbinger noted that at the end of 2010 Harbinger only controlled “roughly 80 percent of the wireless telecom company’s shares”. This raises the obvious question of who controls the other 20%? Clearly, some of these shares might have been offered to LightSquared’s new management team as an incentive, but that can’t account for the difference between the 100% of the equity that Harbinger acquired in March 2010 and the 80% reported as of the end of the year. Did Harbinger manage to offload some of its equity stake in LightSquared last year (as it was reported to be trying to do in July)? Could this account for some of the “$2 billion in equity and debt proceeds and in commitments” that LightSquared highlighted in a press release last October? Who are the potential candidates? I’ve heard various names, but one possibility might be Soros Fund Management, which, according to a November 2010 Wall Street Journal article, “during the past year became a significant new investor” (whether this was in Harbinger or in LightSquared is not explicitly stated in the article). Of course, there may very well be other investors as well. Even more importantly, how much did the other investor(s) pay for what is presumably a near 20% stake? It appears that not all of the $2B in commitments that LightSquared cited in October 2010 actually materialized (presumably the difference is Harbinger’s “$250 million unfunded commitment to LightSquared“), but I’ve assumed in the past that it included both the $850M October 2010 first lien debt and the $400M July 2010 UBS loan. However, rather than Harbinger converting its original (majority $430M holding of) LightSquared’s first lien debt into equity as part of the October 2010 refinancing (as it had previously indicated), it seems that Harbinger instead retained an unfunded $250M commitment at that stage, allowing it finally to take a limited amount of money off the table. As of February 2011, LightSquared indicated that in fact it had actually raised “about $1.75B in debt and equity” (the same figure as given in late September, which refers specifically to $1.75B of debt and equity from “outside investors”), before increasing this to “over $2 billion” when the $586M first lien add-on was completed later that month. That would imply that the new equity investment might have been about $500M for a near 20% stake in LightSquared (i.e. $1.75B minus $850M and $400M) which would certainly fit fairly well with Harbinger’s internal valuation of about $3B for its own 80% LightSquared stake (“about half” of the $6 billion fund’s assets according to Reuters). However, it is slightly puzzling that Harbinger still said only that it had raised “over $2 billion” in February (rather than the $2.3B+ that would have been implied by adding $586M to $1.75B). Was some (half?) of the new outside equity either redeemed or converted to first lien debt in February, or is Harbinger just trying to avoid giving an exact figure for how much it has raised? Of course, if LightSquared really is serious about pursuing an IPO “as early as this summer”, then all of this detail should become much clearer. However, it appears from Sprint’s results call this week that the Network Vision deployment is being delayed until the fourth quarter. That may imply that decision point on a network sharing agreement with LightSquared will also be delayed, presumably until after the results of the GPS interference testing are known in mid June. If Sprint is concerned about whether LightSquared’s spectrum provides adequate security for LightSquared’s commitments under a network sharing agreement, then that would certainly be logical, especially if Sprint views LightSquared (cynically) as an opportunity to boost its spectrum resources at low cost (after a default), rather than as a viable long term supplier of wholesale capacity. Nevertheless, if the first lien debtholders refuse to allow Sprint to pre-empt their claims, then LightSquared might have to move forward with an early (and substantial) IPO to give Sprint the security of more cash in the bank, but otherwise we might not know much more about LightSquared’s financial position for some time to come. How can Sprint get comfortable with LightSquared? Last week, I suggested that LightSquared’s most plausible path to a network sharing deal with Sprint would involve signing a multi-billion dollar take-or-pay capacity contract and using this to raise $1B+ of new equity. It appears that LightSquared is definitely exploring a possible equity raise through an IPO, although that would require it to strike a capacity deal first, and the only obvious large deal at present is via paying part of its obligations to Sprint in kind. Of course that could leave Sprint in the uncomfortable position of being the only potential financial safety net for both LightSquared and Clearwire, precisely the issue which led me to speculate that Sprint might be better off choosing to partner with only one of the two companies. At this point in time, Sprint only gains an advantage in partnering with both LightSquared and Clearwire if it can either be sure that LightSquared will be solvent for long enough to (more than) offset the costs that Sprint would incur in a network sharing agreement, or if LightSquared can provide other adequate security for these obligations. Given LightSquared’s ongoing payments to Inmarsat, and the costs incurred by Sprint in a network sharing buildout, then (under the “deal” modeled by Credit Suisse) that might require new fundraising or guarantees (in addition to LightSquared’s existing cash) of perhaps $1B or more. If LightSquared could successfully execute an IPO then that would presumably help matters significantly, though it is far from clear whether raising anything close to $1B is feasible at this point. Otherwise, I assume Sprint would be looking for other LightSquared or Harbinger assets to secure LightSquared’s obligations. I’m told that one possibility that has been floated is for Sprint to take a first lien position in LightSquared’s spectrum assets, and subordinate the existing $1.5B of debt. That prospect would presumably be very unpopular with existing debtholders, who already have to face a $2B+ obligation to Inmarsat, associated with the Cooperation Agreement (without which half of LightSquared’s ATC spectrum would be forfeited). Alternatively, would Harbinger offer some sort of guarantee secured against its other hedge fund assets (like the $400M UBS loan last July) or even a personal guarantee from Mr. Falcone? As I noted when AT&T announced its deal with T-Mobile a couple of weeks ago, one of the most interesting facts in AT&T’s presentation was that it included significant detail on the traffic growth experienced on AT&T’s wireless network. 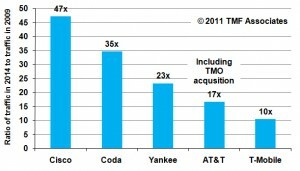 Back in January, T-Mobile also put forward its own expectations that traffic would grow at 60% p.a. between 2010 and 2015. 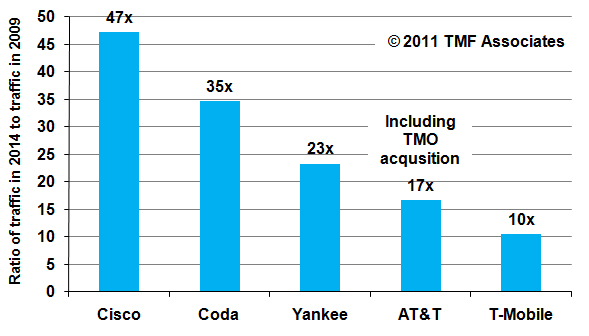 If we compare these figures (assuming T-Mobile’s figure holds for 2009 as well) and look at the ratio of 2014 data traffic to that in 2009 then the Cisco projections are a striking outlier, and the AT&T and T-Mobile expectations are dramatically lower than any of the analyst forecasts. It should also be noted that the AT&T network traffic estimates appear to include the acquisition of TMO, so the actual growth in traffic per subscriber is even lower – AT&T states that its expectation is for 8-10 times growth between 2010 and 2015, very much in line with TMO’s growth projection. Even if data traffic on other wireless networks grows faster than on AT&T’s network, it hardly accounts for a factor of two difference in overall growth, let alone a factor of 4-5 as Cisco estimates. So why do we hear so much from the FCC Chairman about the Cisco forecast as justification for the FCC’s actions to save us from the supposed “spectrum crisis”? As commentators have pointed out, it is after all primarily a sales brochure for Cisco’s network equipment. As an aside, the latest Feb 2011 Cisco forecast even appears to overestimate current wireless traffic, estimating North American wireless data traffic was 49Pbytes per month in 2010, when an extrapolation from AT&T’s figure of 12Pbytes per month at the end of 2010 (assuming AT&T is 40% of US traffic, and the US is 90% of North America) would indicate that the actual traffic is closer to 33Pbytes per month. Why also is the FCC basing policy on its deeply flawed October 2010 paper, which assumes 35 times growth between 2009 and 2014? In my conversations with knowledgeable observers since the AT&T/T-Mobile deal, there seems to be an increasing recognition that the “spectrum crisis” is exaggerated and that there is no near term shortage of spectrum. If the FCC wants to make the case that we need more spectrum by 2018 or 2020 then that’s fine, and maybe it is true that political action is needed on incentive auctions now so that broadcast TV spectrum can be brought into use by 2018. However, basing your arguments on projections that are hugely exaggerated risks the whole edifice tumbling down once these errors are exposed. LightSquared’s new four step path to success? After a difficult March, when Harbinger failed to buy DBSD in partnership with MetroPCS, and Sprint decided not to make the expected announcement of a network sharing agreement at CTIA, it is now becoming possible to discern how LightSquared might plan to move forward. As I noted previously, the key challenge for LightSquared at this point in time is to persuade Sprint that it should undertake a network sharing arrangement, rather than Sprint focusing solely on its partnership with Clearwire. This will only happen if LightSquared can convince Sprint of its ability to bring substantial funding to the table, which would reduce the cost of Sprint’s Network Vision buildout, and mitigate the risk of leaving Sprint holding the bag for increased tower lease costs that would result from adding the LightSquared frequencies. However, LightSquared has already raised $1.5B of first lien debt, and so any further fundraising would have to be subordinated to that, and would therefore likely have to rely on a take-or-pay capacity commitment from a partner. 4) Sign a contract with Ericsson for buildout of the network (replacing NSN). a) How solid can the take-or-pay contract be when there are still interference risks to be resolved? b) Does the LightSquared equity have any value, when there is $1.5B of first lien debt plus a $2B+ spectrum lease/rebanding commitment to Inmarsat ahead of the equity? c) Would it be better for Sprint from a regulatory point of view if (one of) LightSquared or Clearwire folded? However, the overarching issue is where such a huge take-or-pay contract would come from. Could it one of the “top three global consumer electronics companies” that LightSquared claimed to be in “advanced talks” with (these 3 are Samsung, HP and Sony)? However, “connections for services such as wireless photo uploads and wireless multiplayer gaming” seem unlikely to generate that much money. Similarly the deal that LightSquared “has already signed…with a maker of tablet computers and smartphones that could start using LightSquared’s network as soon as the fourth quarter” would require an enormous commitment to come close to billions of dollars in value, which is hard to envisage while the LightSquared network has limited national coverage. If neither of these is a realistic option for more than a fraction of the capacity contracts that are needed, then that brings us back to wireless operators or new entrants – MetroPCS or Leap? One of the potential partners that has been talked about in the past? Who knows? But with T-Mobile out of the picture, the list of possible anchor tenants is pretty short, and both Sprint and skeptical journalists will need to see some concrete progress on LightSquared’s part fairly soon, amounting to more than just a roaming or sales agreement with no hard volume commitments. UPDATE: Credit Suisse is now suggesting that LightSquared would pay 50% of its network sharing costs to Sprint in capacity, which clearly represents multiple billions of dollars of capacity over time. However, in order to convince Sprint to move forward, I think LightSquared’s deals would still have to include major capacity commitments from one or more third parties, so that it can raise the money to pay for the hosting agreement with Sprint. If LightSquared paid $500M upfront in cash, plus $1200 per month per base station in cash for 45,000 base stations as Credit Suisse suggests, it would need to pay Sprint about $650M per year in cash for these hosting fees once the network was fully rolled out, and in excess of a billion dollars in cash in total over the next three years before it can generate much revenue. Given that this does not include LightSquared’s other core network development and operating costs (including the ongoing payments to Inmarsat), and as Credit Suisse admits, Sprint would spend an extra $1.2B between LightSquared and Clearwire before it started to make money from the hosting agreement (and is liable for ongoing payments to tower companies of $700 per tower per month), I think Sprint will want to see that LightSquared is able to fund at the very least the next several years of payments before committing to a deal. This clearly puts the onus back on LightSquared to secure substantial additional capacity commitments from companies other than Sprint, and raise significant equity funding ($1B+) in the very near future. As this chart shows, the types of receivers that are most affected are high precision receivers used in applications such as farming and surveying, although lower precision receivers such as those incorporated in automobile navigation and even in cellphones may be impacted closer to the LightSquared base stations. Aeronautical navigation is an area of particular concern, given the safety critical nature of this application. Testing is now ongoing to determine the extent of interference, and early estimates of the impact vary greatly, ranging from a few hundred meters or less up to several miles for low precision receivers, and potentially tens of miles for high precision receivers. In reality, whether or not cellphone manufacturers ultimately decide an additional filter is needed to protect their GPS receivers, the overall cost impact would be far, far greater than PRTM indicate. To take a directly analogous situation, LightSquared is paying Inmarsat $250M to fit filters to its L-band satellite terminals on up to 10K aircraft and perhaps 50K ships. If we assume these filters cost $30 rather than 30 cents each, then following PRTM’s calculations the cost of solving the problem would be less than $2M. However, Inmarsat expects to spend the vast majority of the $250M it is receiving on actually fixing the problem, and the filters themselves are less than 1% of the total cost. Instead, the bulk of the expenditure will go on securing approvals (including from safety authorities) for replacement equipment, then going out and fitting this equipment on ships and aircraft. Across the GPS industry the same considerations would apply – dramatically increased costs for testing, safety approvals, retrofits of existing equipment, etc. not to mention the markups that would apply to the filter component costs as they flow through to an increased total cost of the devices sold. Many of these costs would be concentrated in lower volume and safety critical applications such as the aeronautical market, and if some GPS users experienced a permanent loss of accuracy, then there could be additional indirect costs to consumers (e.g. reduced crop yields leading to higher food costs). Just to give one example, the National Association of Wheat Growers indicated that its members have invested $3B in GPS equipment for precision farming, in order to increase the productivity and efficiency of farm processes. Thus it is more credible to look at the total cost impact on manufacturers and consumers as being of order $1B+ per year over the next decade, as tens of billions of dollars of equipment needs to be upgraded or replaced. As in the Inmarsat situation, PRTM’s estimate of the filter hardware costs (for what was in any case only a subset of the overall GPS equipment market) likely represents no more than 1% of the total bill. Given that such a large cost impact might well outweigh the value of freeing up additional L-band spectrum, it would be very interesting to see a detailed cost-benefit analysis of these issues, so that economic rationality can play some part in the ultimate decision. Nevertheless, despite the significant cost impact on the GPS industry and end users, the FCC might still decide to impose “receiver standards” on future GPS devices. However, it would still take considerable time before these standards became effective. For example, the FCC could easily take 12-18 months (or longer) to decide on what receiver standards to mandate, and then it might require that all new GPS receivers manufactured after say the end of 2014 were capable of withstanding potential interference. Then there would need to be several more years for older devices to be replaced or updated, with a sunset date perhaps as late as the end of 2018 or 2019 (or beyond). Assuming that this is the path the FCC decides to follow, it is still unclear what spectrum LightSquared would then be able to use for its network in the near term. The Phase 0 spectrum which is currently available to LightSquared has its downlink between 1550 and 1555MHz, which is the channel closest to the GPS band, and so its use would likely be heavily restricted or completely prohibited until GPS receiver standards came into force. 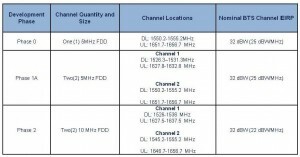 LightSquared gains access to an additional 2x5MHz channel (the Phase 1A spectrum) sometime between February and November 2012, depending on how quickly this is cleared by Inmarsat. This channel is at the bottom end of the band (1526-1531MHz downlink) and so is the least likely to interfere with GPS. LightSquared then adds 2x10MHz of additional spectrum (Phase 2) with downlinks at 1531-1536MHz and 1545-1550MHz at the end of July 2013. However, it is uncertain whether and under what conditions the use of the 1545-1550MHz band would be permitted before any receiver standards came into force. 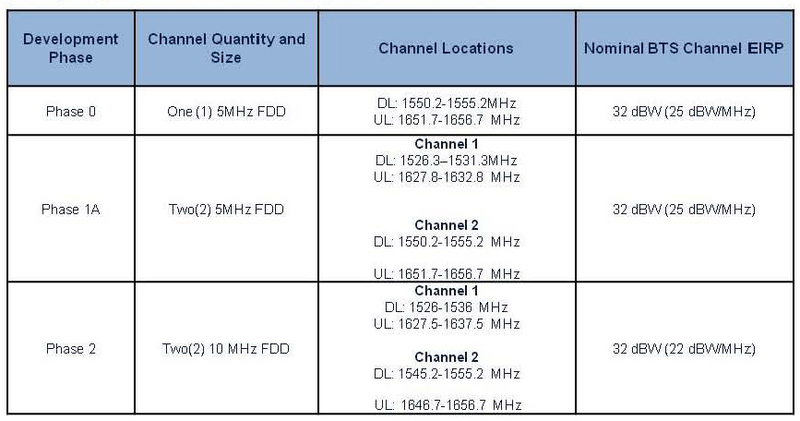 This timeline indicates that (if Channel 1 is usable) LightSquared should have access to 2x5MHz of spectrum sometime in 2012 and at least 2x10MHz of spectrum from the end of July 2013. However, it is far from clear (even assuming LightSquared has a network contractor in place) how the company expects to offer service by the end of 2011. More broadly, the outcome of the GPS interference testing and FCC deliberations also remains in doubt. PRTM characterized this as “a situation where the neighbor [GPS] built the fence too far over the property line and may not have realised it at the time. Now the other neighbor wants to build a pool and there is not enough space. So the question is: who has to pay to move the fence?”. However, I look at the analogy somewhat differently – regardless of where the fence is, if you have protected butterflies [defense and aviation systems] living at the bottom of both gardens, will the government let you build a pool at all?